Most finished products require multiple WIPs in order to manufacture. This results in a multi-layered Bill of Materials. AXIOM does not do a good job of presenting multi-layer BOMs. Where AXIOM leaves off, BART picks up. BART presents key information of a Multi-layer bill of materials. As you can imagine, calculating this could take some CPU time. 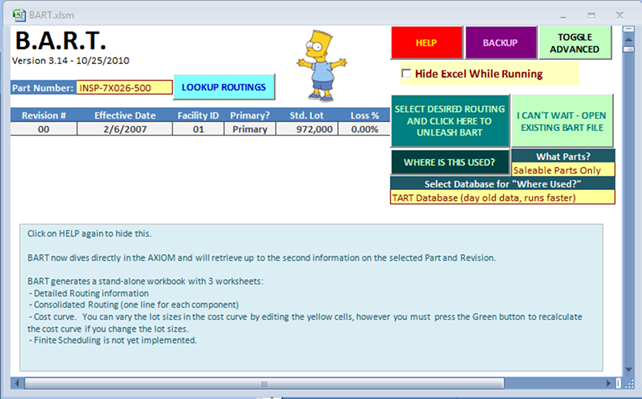 An AutoBART utility searching the AXOIM database for changes in BOMs for all WIPs and finished goods, and regenerates the BOM automatically, so when a user wishes to access a particular BOM, it opens as an Excel Workbook in a few seconds. BART doesn't stop there. BART can also calculate lead times for manufacture of finished goods. BART considers raw material availability, allocation and lead times, as well as capacity limitations and allocations. BART builds a dynamic Excel workbook which allows the user to play "What if?". The user can enter how much of a finished good is desired, and the BART file will tell the user when that amount could be produced.